The products of weathering and erosion are the unconsolidated materials that we find around us on slopes, beneath glaciers, in stream valleys, on beaches, and in deserts. 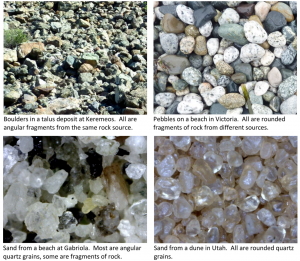 The nature of these materials — their composition, size, degree of sorting, and degree of rounding — is determined by the type of rock that is being weathered, the nature of the weathering, the erosion and transportation processes, and the climate. A summary of the weathering products of some of the common minerals present in rocks is provided in Table 5.1. Some examples of the products of weathering are shown in Figure 5.13. They range widely in size and shape depending on the processes involved. If and when deposits like these are turned into sedimentary rocks, the textures of those rocks will vary significantly. Importantly, when we describe sedimentary rocks that formed millions of years in the past, we can use those properties to make inferences about the conditions that existed during their formation. 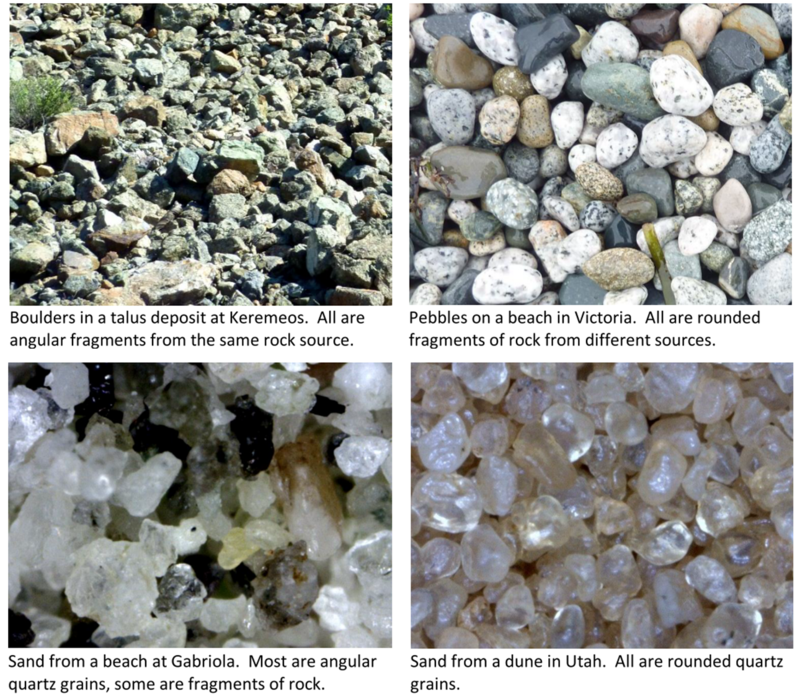 We’ll talk more about the nature and interpretation of sediments and sedimentary rocks in Chapter 6, but it’s worth considering here why the sandy sediments shown in Figure 5.13 are so strongly dominated by the mineral quartz, even though quartz makes up less than 20% of Earth’s crust. The explanation is that quartz is highly resistant to the types of weathering that occur at Earth’s surface. It is not affected by weak acids or the presence of oxygen. This makes it unique among the minerals that are common in igneous rocks. 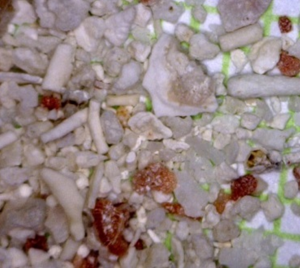 Quartz is also very hard, and doesn’t have cleavage, so it is resistant to mechanical erosion. As weathering proceeds, the ferromagnesian silicates and feldspar are very likely to be broken into small pieces and converted into clay minerals and dissolved ions (e.g., Ca2+, Na+, K+, Fe2+, Mg2+, and H4SiO4). In other words, quartz, clay minerals, and dissolved ions are the most common products of weathering. Quartz and some of the clay minerals tend to form sedimentary deposits on and at the edges of continents, while the rest of the clay minerals and the dissolved ions tend to be washed out into the oceans to form sediments on the sea floor. Fragments of coral, algae, and urchin from a shallow water area (~2 m depth) near a reef in Belize. The grains are between 0.1 and 1 mm. 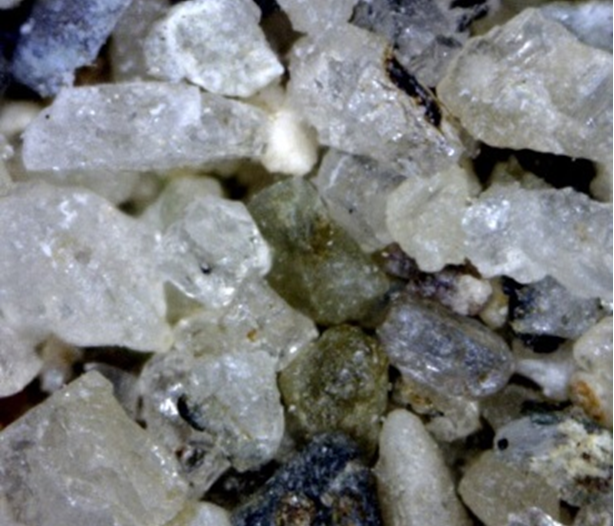 Angular quartz and rock fragments from a glacial stream deposit near Osoyoos, B.C. 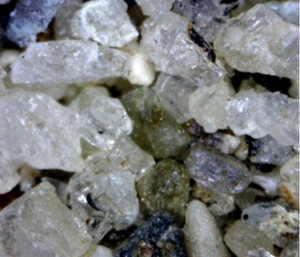 The grains are between 0.25 and 0.5 mm across. Rounded grains of olivine (green) and volcanic glass (black) from a beach on the big island of Hawaii. 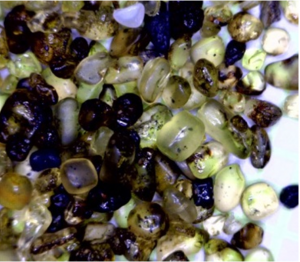 The grains are approximately 1 mm across. 5.3 The Products of Weathering and Erosion by Steven Earle is licensed under a Creative Commons Attribution 4.0 International License, except where otherwise noted.